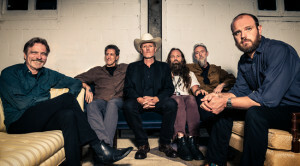 Swans‘ frontman Michael Gira originally thought he would be a visual artist. Since childhood, he regularly created illustrations and “devoured books on art.” He even went to art school. It was there that he was introduced to punk rock, which he has said “seemed more relevant and urgent and necessary than forging some kind of art career, which was beginning to look like a parallel career to being a lawyer or accountant.” Initially, he started what he has called a “pretty bad punk rock band” called the Little Cripples that played a show in San Francisco. Shortly after moving to New York in 1979, he launched the oppressively noisy Swans which kept going strong until 1997 when the group disbanded and Gira started up the avant folk act Angels of Light. About five years ago, Gira had some songs for what he presumed would be a new Angels of Light record. In the process of arranging them, he realized they would function better as Swans songs so he re-formed the band and issued My Father Will Guide Me on the Rope to the Sky, what he calls a “transitional album.” In 2103, Swans followed it up with The Seer, an album of hypnotic tunes that sound a bit like something Nick Cave might have worked up back in his Birthday Party days. And now the Swans are about to begin the sixth leg of a year-long world-wide tour celebrating the release of their two-CD set, last year’s To Be Kind, the third studio album from the reactivated band. We recently spoke to Gira about the album and upcoming tour via Skype. To Be Kind is the third album after the band became active again in 2010 after a 14-year hiatus. Talk about what made you want to activate the band five years ago. I guess I was at an impasse in my life and creatively at that time. I was involved in Angels of Light. It was less and less compelling to me. I decided that the way out of this impasse was to throw myself into the fire again and experience the kind of sound that Swans can make. I reconstituted the band with various members that had been in the group before or that I had worked with on various other projects. As we played over the next two to three years, we developed our own sound. It culminated in this album called The Seer. To Be Kind grew out of playing that material live. The song “Bring The Sun/Toussaint L’Ouverture” grew out of the song “The Seer.” As that song ended, there were these open clouds of sound that opened up and we introduced a groove that morphed into the next piece. We’re doing a similar thing now. There are songs that grow out of playing older songs. They grow into something new. So these are songs you worked out ahead of time through live performances. Talk about that process. I don’t know. It’s using intuition and finding what is urgent and what needs to be addressed and leaving the rest behind, I suppose. What was the studio experience like for To Be Kind? Like most of our studio experiences, it was fraught with terror. I become a maniac and work endless hours. I start recording the material and I hear new things and it becomes way over-recorded and over-dubbed so I fling it against the wall and break it into pieces and then make something new out of that. You’ve also released a digital EP of “Oxygen” from To Be Kind, featuring four different versions: an edit of Oxygen by Mute founder Daniel Miller, a live version from Primavera, an early version recorded at your home and an acoustic version recorded at Studio Mute. Talk about the release a bit. Those already existed. One of the versions was entirely different music and chords. It was a different melody. That was how the song originated. I tried to record it with Swans and it sounded dumb and it just didn’t work. I discarded it and was searching for new material and I liked many of the words. So I came up with this groove and it morphed into the song as you hear it on the record. As far as the EP, that was entirely at the suggestion of Mute Records who license Young God records outside the U.S. I was fine doing that. I love the way that opening number “Screen Shot” slowly builds. What inspired the song? The music is just a groove. It slowly agglomerates more sound. The words are a meditation. Well, they are meditation. They’re not on something. In Zen, they often present conundrums and they’re hard to parse. They state something that is the opposite and you’re supposed to find the truth between the two statements. They’re contradictory statements but both are true. I think it clocks in at 122 minutes. One reviewer compared it to a feature film. Do you feel like that’s an apt comparison? That would be flattering if it were true. I’m not so certain it is. Once I get involved in making an album, I’m thinking about a film as well. It’s an entirely pretentious undertaking. That’s how I view it. I’m not inclined towards making a normal rock record at this point. I’m trying to find new ways to engage with the sonic world. When you push into areas where you don’t belong it can result in abject failure too. Have you worked in cinema? I haven’t. I did a soundtrack to a small film once. I’m surprised. I would think you’d be in demand. I don’t know why that is. Maybe when I give up and accept that it will never happen, it will happen. Talk about the label and what you set out to accomplish with it? That was a time when I had my primary focus creatively was Angels of Light. It wasn’t taking up all my time, I suppose. I came into contact with younger musicians and realized that maybe I could help them. In so doing, I tried to find their strengths and bring them to the fore. Maybe it’s presumptuous of me to entertain that role, but I did. It was challenging and rewarding time. Working with the young Devendra Banhart was one of my most rewarding experiences. At the time, I viewed him as a nascent genius. He was tremendously musical and effervescent. He was exploding with ideas and joy and the joy of making music. What new music do you like? I don’t pay too much attention. I’m so involved with touring all the time and being in the studio. I know there’s good music being made. I just heard this amazing piece today by this young man named Richard Dawson. He’s an incredible guitar player and singer. The song I heard today was great. It’s “The Vile Stuff.” It’s fantastic. I don’t pay attention to the music scene otherwise. People cross my path and I like them or I don’t. You started making music decades ago. Is there a thread linking everything together? I don’t know what the connecting thread is. I think [the underlying element] is shaping sound and making trying to make sound environments in which people can live. It’s gone from harsher sound of the early days to whatever the hell you call what we do now. My sensibility as a writer comes into play. I don’t know how to describe it except that I’m a little fearless in terms of jumping into areas where I’m uncomfortable. I’m not truly a musician in terms of my training. I work from intuition. I try not to be terrified by my own incompetence. You might be too hard on yourself. There’s actually a strength in that. Punk rock wouldn’t have happened if people had been conscious of their musical skills. There are six songs in the set and four of them are unrecorded. They’re things that are finding their own shape. It’s like lava flowing down the hill. They’re still finding their path down the mountain. Those four things will be on a new album which we’ll record in September. Finally, I had a little time to myself and I wrote a couple of songs so with those four and these two, there’s certainly a new album.